We had a busy and a happy day. First, children and teachers prepared a big pot of Harvest Soup. Children brought the vegetables. Some came from their family or their school garden. There were vegetables of all colors and when it was all chopped up and mixed in a pot, they looked like confetti! Older children were able to use cutters to cut, some used scissors to cut leafy vegetables. Children used nimble fingers to peel garlic and onion skins and tear basil leaves. We grated salt from the ocean and put in some homemade miso to taste. Imagine what the classroom smelled like! In stead of going on a walk, children helped set up the playground for families and neighbors to come for the event. Unfortunately, none of the neighbors were able to join us this time. Fuller stopped by to say that she has someone coming over to her house. Another neighbor was in the hospital just after a major operation. We were sorry to miss them. Children helped carry the table clothes, cups, pitchers, soap and towels. We went to fetch water in the 5 gallon container. They were excited to help! When families arrived, we met and introduced ourselves. 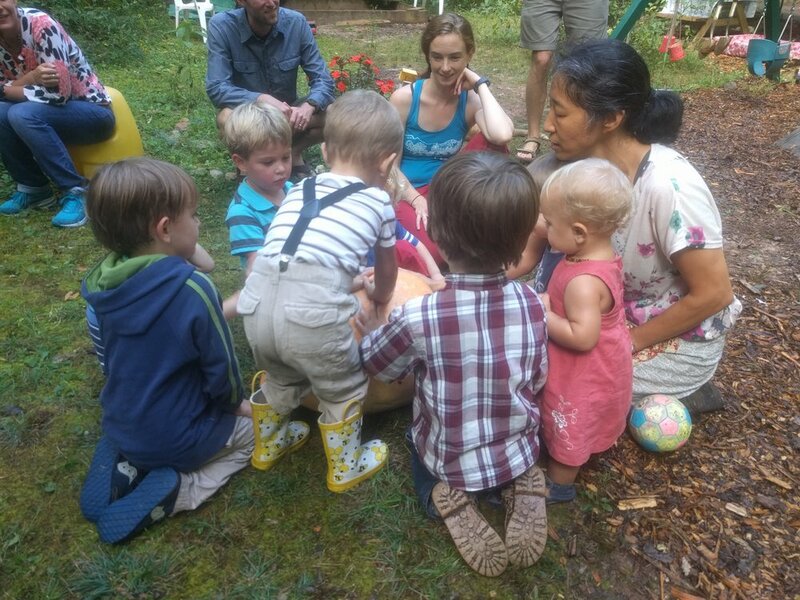 We played a game “Catch the tail” and gathered again to admire a big candy roaster squash which came from Mari’s garden. We thanked the earth and the sun for providing our food. After singing “Summer Good Bye” we enjoyed our Harvest Soup and other delicious dishes that families brought to share. We are so blessed with the wonderful community of children and their families. A big thank you to Carly who jumped in to help the preschool today. We were lucky to have you!